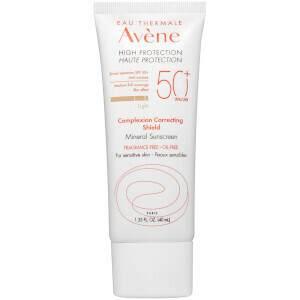 Protect and perfect your skin with Avène's High Protection Complexion Correcting Shield SPF 50+ in 'Medium', a 100% mineral, broad spectrum sunscreen with complexion-correcting properties. Delivering high sun protection and 24-hour hydration, the antioxidant-rich formula glides effortlessly over skin, safeguarding against UV rays whilst imparting soft focus microspheres to visibly improve and blur the appearance of imperfections, including: large pores, uneven skin tone, redness, fine lines and wrinkles. Offering medium to full coverage, the skin-perfecting sun lotion will lend your complexion an even and flawless finish whilst fighting free radicals for healthy, smoother-looking skin. Free from oil, fragrance, parabens and chemical filters. Apply liberally 15 minutes before sun exposure. Reapply at least every 2 hours. Use a water resistant sunscreen if swimming or sweating. Active Ingredients: Titanium Dioxide 12.5%, Zinc Oxide 15.6%. Inactive Ingredients: Water, Caprylic/Capric Triglyceride, Hydrogenated Polyisobutene, Dimethicone, Butyloctyl Salicylate, Isodecyl Neopentanoate, Iron Oxides, Polyhydroxystearic Acid, C12-15 Alkyl Benzoate, Magnesium Aluminum Silicate, Polymethyl Methacrylate, Potassium Cetyl Phosphate, Vp/Eicosene Copolymer, Polysorbate 20, Soyethyl Morpholinium Ethosulfate, Trimethylsiloxysilicate, Cetearyl Alcohol, Xanthan Gum, Glycerin, Phenoxyethanol, Hydrogenated Lecithin, Stearic Acid, Peg/Ppg/Polybutylene Glycol-8/5/3 Glycerin, Carbomer, Ceramide Ap, Ceramide Eop, Ceramide Np, Phytosphingosine, Cholesterol, Sodium Lauroyl Lactylate, Tocopherol, Sodium Hyaluronate, Ethylhexylglycerin, Disodium Edta, Tocopheryl Acetate, Allantoin, Ascorbic Acid.